The 10th Special Forces Group (Airborne) (10th SFG(A) or 10th Group) is an active duty United States Army Special Forces (SF) Group. The 10th Group is responsible for operations within the EUCOM area of responsibility, as part of Special Operations Command Europe (SOCEUR). In 2009, as part of a new SOCOM directive, the group is now also responsible for operations within the AFRICOM area of responsibility. 10th SFG(A) was deployed to Saudi Arabia in 1991 during the First Persian Gulf War. The 10th SFG has been heavily involved in the War on Terrorism, deploying to Georgia, North Africa, Afghanistan, and consistently to Iraq. The 10th SFG(A) was constituted 19 May 1952 and activated on 11 June 1952, at Fort Bragg, North Carolina, under the command of Colonel Aaron Bank. The group was split in 1953, with one half being sent to Germany, while the other half remained at Fort Bragg to form the core of the 77th Special Forces Group (redesignated as the 7th SFG in 1960). In 1968, the majority of the unit transferred to Fort Devens, Massachusetts, with the exception of 1st Battalion, which remained in Germany. Between 1994 and 1995, 10th SFG(A) moved to Fort Carson, Colorado, which remains its current home. 10th Group began training with unconventional warfare groups from friendly countries in the 1960s, beginning with NATO allies. The group has also trained various components of the militaries of several Middle Eastern countries, including Lebanon, Jordan, Yemen, Iran, as well as Kurdish tribesmen. Units of the 10th SFG(A) have participated in humanitarian missions to the Congo, Somalia, and Rwanda. The Regimental Insignia of the Special Forces. In 1950, the Lodge Act was passed, which provided for the recruiting of foreign nationals into the United States military. It was originally planned that half of the members of the Special Forces would be native Europeans. Many of the initial members of the 10th SFG(A) were Lodge Act recruits, who were strenuously anti-Communist. Among the more notable of these men was MAJ. Larry Thorne, a former Finnish Army soldier who was awarded the Mannerheim Cross during World War II. The 10th SFG(A) was constituted 19 May 1952 and activated on 11 June 1952, at Fort Bragg, North Carolina, under the command of Colonel Aaron Bank. The group was split in 1953, with one half being sent to Germany, while the other half remained at Fort Bragg to form the core of the 77th Special Forces Group (redesignated as the 7th SFG in 1960). 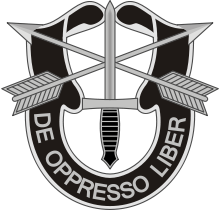 On 10 November 1953, the 10th SFG(A) was split in half, with one half deployed to Bad Tölz and Lenggries in West Germany, and the other remaining in Fort Bragg to become the 77th Special Forces Group (which in 1960 became the 7th Special Forces Group). The green beret was authorized for wear by Col. William E. Ekman, the group commander, in 1954, and it became group policy. By 1955, every soldier in the unit wore a green beret as part of the uniform. However, the Department of the Army (DA) did not recognize the beret as headgear. The DA banned the wear of the beret, but in 1961 it was restored by President Kennedy, a major champion of the Special Forces. The 10th Group encountered publicity for the first time in 1955 when The New York Times published two articles about the unit, describing them as a "liberation" force designed to fight behind enemy lines. Pictures showed soldiers of the group wearing their berets, with their faces blacked out to conceal their identities. The A-teams of 10th Group began exchange training with unconventional forces in friendly countries, including United Kingdom, Germany, France, Norway, Spain, Italy, and Greece. In the summer of 1960, 10th Group deployed to the newly independent Congo, to evacuate Americans and Europeans to Leopoldville, where there would be a larger evacuation, led by Belgian paratroopers. The group evacuated 239 civilians without a single casualty in only nine days. As the United States became increasingly involved in Vietnam, counter-insurgency became the primary focus of the Special Forces, rather than the traditional unconventional warfare. While the 10th SFG(A) was never deployed to Vietnam, the soldiers and officers assigned to it did rotate through the country as part of different special forces groups. During the Vietnam War, detachments of 10th Group began training Middle Eastern special warfare forces. In Jordan, B Detachment established the first airborne school, and King Hussein attended the graduation parachute jump. In 1963, Company C of 10th Group trained 350 officers and NCOs of a guerrilla force fighting the socialist government in Yemen. Detachments also traveled to Iran to train the Iranian Special Forces, along with Kurdish tribesmen in the mountains of Iran. A-Teams also trained Turkish and Pakistani special forces. In 1968, 10th Group, minus the 1st Battalion, was transferred to Fort Devens, Massachusetts. 1st Battalion remained in Bad Tölz, Germany. Following the military cuts after the end of the Vietnam War, operational deployments decreased in both number and frequency. However 10th Group still deployed frequently to Europe to train with NATO allies. From 11 May 1983 to 25 October 1985, 10th Group deployed 17 Mobile Training Teams (MTT) to Lebanon, to support the Lebanese Army. The teams created a training program for over 5,000 officers, NCOs, and soldiers, which included basic training sites, unit training, unit combined arms live fire training, and urban live fire training. The entry of the Syrian Army into Lebanon ended the program prematurely. An MTT from the 1st Battalion, Bad Tölz, Germany deployed to Somalia for four months to conduct disaster relief operations in June 1985. In 1986, a detachment of 10th Group trained the nucleus of the Nigerian Airborne forces. The 10th Group was the leading force behind the development of the M25 sniper rifle in the late 1980s, at Fort Devens. The rifle is an improvement on the previous M21 sniper rifle, itself a modification of the M14 semi-automatic rifle. During this era the 10th Group acted as the annual training (AT) host for its sister unit in the Army Reserve, the 11th Group. ATs would typically take place during the summer months. As part of its AT support, the 10th Group ran a two-week Basic Airborne course for new 11th Group personnel who were not yet Airborne qualified. The 10th also ran a two-week jumpmaster course for 11th Group personnel. Typically the 10th would run an Airborne course one year and a jumpmaster course during the next. For example, the 10th ran a Basic Airborne course for 11th Group personnel in July 1978 and a jumpmaster course in July 1979. In addition to 11th Group personnel, the 10th sent its own support personnel through its in-house Airborne course, and members of the ARNG's 20th Group were known to attend as well. Following the Iraqi invasion of Kuwait, an MTT deployed to Kuwait to train the Saudi Arabian National Guard. During the Battle of Khafji, the MTT accompanied the SANG forces into battle, coordinated troop movements, called in airstrikes, and assisted with artillery fire support. Other elements of 10th Group deployed to southeast Turkey in support of operations Desert Shield/Desert Storm. The Boston Herald reported: "The 10th Special Forces Group's penchant for secrecy is so exacting the base publicist didn't know the unit had gone to war until they were on their way home from Operation Desert Storm." Following the end of the Gulf War, Saddam Hussein turned his attention to Iraq's Kurdish minority, causing over half of a million Kurds to flee into the mountains on the Turkish-Iraqi border. Under the leadership of Colonel William Tangney, all three battalions of 10th Group were deployed to the area for Operation Provide Comfort, a UN humanitarian effort. 10th Group coordinated the ground relief effort, and was credited by General Galvin, the EUCOM commander, as having "saved half a million Kurds from extinction". During Operation Restore Hope, 10th Group deployed a Coalition Support Team to support the 1st Belgian Para-Commando Battalion. In addition to supporting the Para-Commando unit, the CST assisted the 10th Mountain Division, and provided security for meetings with Somali leaders. Following the ethnic conflict in Rwanda, 10th Group deployed to Entebbe airfield, Uganda. The group assisted the displaced persons in returning to their homes. On 2 September 1994, 2nd Battalion, 10th SFG(A) transferred to Fort Carson, Colorado, followed by 3rd Battalion on 20 July 1995. The group headquarters moved to Fort Carson on 15 September 1995, ending a 27-year presence in Massachusetts. Affiliated for operations with Special Operations Command – Europe, 10th Group is continuing to conduct Joint Combined Exchange Training and FID/anti-terrorist operations as part of Operation Enduring Freedom – Trans Sahara. Such activities have included training the Military of Mali and the Military of Mauritania. The 1st and 3rd Battalions of 10th Group also participated in training in Senegal in 2006, along with the 352d Special Operations Group of the US Air Force. 10th SFG(A) has also deployed numerous times in support of Operation Enduring Freedom and Operation Iraqi Freedom, but mostly to Iraq, since the start of the War on Terrorism. 10th SFG(A) and CIA's Special Activities Division Paramilitary Officers were the first to enter Iraq prior to the invasion. They organized the Kurdish Peshmerga to defeat Ansar al-Islam, an ally of al-Qa'ida, for control of a territory in Northeastern Iraq that was completely under Ansar al-Islam's control. This battle, one of the most important engagements for Special Forces since Vietnam, led to the elimination of a substantial number of terrorists and the discovery of a chemical weapons facility at Sargat (the only facility of its type discovered in the Iraq war). Three Silver Stars and six Bronze Stars for valor were conferred for this engagement. These terrorists would have been part of the subsequent insurgency had they not been eliminated during this battle, which could be called the Tora Bora of Iraq. While several key leaders escaped into Iran, it was a sound defeat for al-Qaeda and Ansar al-Islam. The Americans then led the Peshmerga against Saddam's northern Army. This effort kept Saddam's forces, including 13 Armored Divisions, in the north and denied them the ability to redeploy to contest the invasion force coming from the south. This effort likely saved the lives of hundreds, if not thousands, of coalition service members. Colonel Aaron Bank – The "Father" of Army Special Forces and first commanding officer of the 10th Special Forces Group (Airborne). Major Larry Thorne – Finnish soldier who fought the Soviet Army during the Winter War, immigrated to the United States after World War II and joined the US Army under the Lodge-Philbin Act. 10th Group honors him yearly by presenting the Larry Thorne Award to the best Operational Detachment-Alpha in the command. In an episode of The Big Picture released in 1962 and composed of footage filmed in 1959, Thorne is shown as a lieutenant with the 10th Special Forces Group in a United States Army. Master Sergeant Gary Gordon – Went on to service with Delta Force, awarded the Medal of Honor posthumously for his actions during the Battle of Mogadishu. He was portrayed by the Danish actor Nikolaj Coster-Waldau in the 2001 film Black Hawk Down. Major Tommy Sowers: Duke University graduate, Iraq War veteran. Graduated top of his class from the Special Forces Qualification Course. Completed a PhD at the London School of Economics. Served as Assistant Secretary of Veterans Affairs for Public and Intergovernmental Affairs (August 2012-April 2014). Colonel Jerry Sage - Early 1960s commander and World War II OSS veteran captured by Germans during the Kasserine Pass battle. While a prisoner at the Stalag Luft III, where he played a major role in the famed "Great Escape" as the prisoners' security Chief before American prisoners were transferred to a separate compound. Colonel Sage was portrayed by actor Steve McQueen in the 1963 film The Great Escape. ^ "Maryland Soldier Killed by Roadside Bomb in Afghanistan". nbcwashington. 5 October 2016. ^ a b "10th Special Forces Group (Airborne)". Archived from the original on 14 May 2008. Retrieved 10 May 2008. ^ "SOCom directive announces major changes | Army Times | armytimes.com". Archived from the original on 5 July 2013. Retrieved 2013-07-01. ^ a b c d e f g h i j k l "10th Special Forces Group 1st Special Forces Regiment" (URL). Archived from the original on 9 February 2017. Retrieved 11 February 2017. ^ a b "Special Forces: The Early Years" (URL). Retrieved 11 February 2017. ^ Southworth, Samuel A. (2002). U.S. Special Forces. Da Capo Press. ISBN 978-0-306-81165-4. ^ a b Pushies, Fred J. (2001). U.S. Army Special Forces. Zenith Press. ISBN 978-0-7603-0862-2. ^ Moore, Robin (2007). The Green Berets: The Amazing Story of the U.S. Army's Elite Special Forces Unit. Skyhorse Publishing, Inc. ISBN 978-1-60239-017-1. ^ a b c d e Hagerman, Bart (1997). U.S.A. Airborne: 50th Anniversary. Turner Publishing Company. ISBN 978-0-938021-90-2. ^ "U.S. Pushes Anti-Terrorism in Africa". The Washington Post. 26 July 2005. Retrieved 10 May 2008. ^ "Special Forces Support Pan Sahel Initiative in Africa". Archived from the original on 19 May 2008. Retrieved 10 May 2008. ^ "352nd SOG wraps up JCET to Trans-Sahara, Africa". Archived from the original on 11 February 2009. Retrieved 11 May 2008. ^ "1st Battalion Newcomers' page". Archived from the original on 4 November 2014. Retrieved 3 November 2014. ^ States New Service (30 June 2010). "The Ideal Green Beret". HighBeam Research. Archived from the original on 11 June 2014. Retrieved 16 January 2014. ^ "Phantom Fighters. USA Special Forces Training." (TV-448) 1962 via LiveLeak. ^ Sage, Jerry (1985). Sage. Dell Publishing Compant. ISBN 978-0440075806.